Astronomers at the California Institute of Technology (Caltech) and their colleagues used a rare cosmic alignment and modern adaptive optics to image a distant galaxy with similar exquisite resolution promised by the future Thirty Meter Telescope (TMT). This achievement provided detailed insight into the nature of a young star-forming galaxy as it appeared only two billion years after the Big Bang, and determined how that galaxy may eventually evolve to become a system like our own Milky Way. The team made their observations by coupling two techniques, gravitational lensing --which makes use of an effect first predicted by Albert Einstein in which the gravitational field of massive objects, such as foreground galaxies, bends light rays from objects located a distance behind, thus magnifying the appearance of distant sources -- and laser-assisted guide star (LGS) adaptive optics (AO) on the 10-meter Keck Telescope in Hawaii. Adaptive optics corrects for the blurring effects of Earth's atmosphere by real-time monitoring of the signal from a natural or artificial guide star. Gravitational lensing enlarged the distant galaxy in angular size by a factor of about eight in each direction. Together with the enhanced resolution using adaptive optics, this allowed the team to determine the internal velocity structure of the remote galaxy, located 11 billion light-years from Earth, and hence its likely future evolution. The researchers found that the distant galaxy, which is typical in many respects to others at that epoch, shows clear signs of orderly rotation. The finding, in association with observations conducted at millimeter wavelengths, which are sensitive to cold molecular gas (an indicator of galactic rotation), suggests that the source is in the early stages of assembling a spiral disk with a central nucleus similar to those seen in spiral galaxies at the present day. The research, described in the October 9 issue of the journal Nature, provides a remarkable demonstration of the likely power of the future TMT, the first of a new generation of large telescopes designed to exploit AO. When completed in the latter half of the next decade, TMT's giant primary mirror and improved optics will produce images with an angular resolution three times better than the 10-meter Keck and 12 times better than the Hubble Space Telescope, at similar wavelengths. 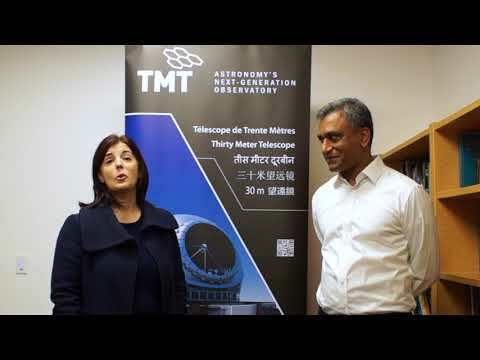 Because of the spectacular improvement in angular resolution provided by AO, the TMT will be able to study the internal properties of small distant galaxies, seen as they were when the Universe was young. Likewise, the Atacama Large Millimeter Array (ALMA), a large interferometer being completed in Chile, will provide a huge step forward in mapping the extremely faint emission from cold hydrogen gas -- the principal component of young, distant galaxies and a clear marker of cold molecular gas -- compared to the coarser capabilities of present facilities. In their recent research, the Caltech-led team has provided an impressive glimpse of what can be done with the superior performance expected of TMT and ALMA. Using the Hubble Space Telescope, the team located a distinctive galaxy dubbed the "Cosmic Eye" because its form is distorted into a ring-shaped structure by the gravitational field of a foreground galaxy. "Gravity has effectively provided us with an additional zoom lens, enabling us to study this distant galaxy on scales approaching only a few hundred light-years. This is ten times finer sampling than hitherto possible," explains Postdoctoral Research Scholar Dan Stark of Caltech, leader of the study. "As a result, we can see, for the first time, that a typical-sized young galaxy is spinning and slowly evolving into a spiral galaxy much like our own Milky Way," he says. The key spectroscopic observations were made with the OSIRIS instrument, developed specifically for the Keck AO system by astrophysicist James Larkin and collaborators at the University of California, Los Angeles. Stark and his co-workers used the OSIRIS instrument to map the velocity across the source in fine detail, allowing them to demonstrate that it has a primitive rotating disk. To aid in their analysis, the researchers combined data from the Keck Observatory with data taken at millimeter wavelengths by the Plateau de Bure Interferometer (PdBI) located in the French Alps. This PdBI instrument is sensitive to the distribution of cold gas that has yet to collapse to form stars. These observations give a valuable glimpse of what will soon be routine with the ALMA telescope. "Remarkably, the cold gas traced by our millimeter observations shares the rotation shown by the young stars seen in the Keck observations. The distribution of gas seen with our amazing resolution indicates we are witnessing the gradual build up of a spiral disk with a central nuclear component," explains co-investigator Mark Swinbank of Durham University, who was involved in both the Keck and PBI observations. This breakthrough demonstrates how important angular resolution has become in ensuring progress in extragalactic astronomy. This will be the key gain of both the TMT and ALMA facilities. "For decades, astronomers were content to build bigger telescopes, arguing that light-gathering power was the primary measure of a telescope's ability," explains Ellis. "However, adaptive optics and interferometry are now providing ground-based astronomers with the additional gain of angular resolution. The combination of a large aperture and exquisite resolution is very effective for studying the internal properties of distant and faint sources seen as they were when the Universe was young. This is the exciting future we can expect with TMT and ALMA and, thanks to the magnification of a gravitational lens, we have an early demonstration here in this study," he says. The W. M. Keck Observatory operates twin 10-meter telescopes located on the summit of Mauna Kea. The Observatory, made possible by grants from the W. M. Keck Foundation totaling over $138 million, is managed as a non-profit corporation whose board of directors includes representatives from Caltech and the University of California. The TMT is currently in the final stages of its design phase. The plan is to initiate construction in 2010 with ‘first light’ in early 2018. This project is a partnership among the California Institute of Technology, the University of California, and ACURA, an organization of Canadian universities. The Gordon and Betty Moore Foundation has provided $50 million for the design phase of the project and has pledged an additional $200 million for the construction of the telescope. ACURA committed an additional $17.5 million for the design and development of TMT. Co-authors on the paper, "The formation and assembly of a typical star-forming galaxies at redshift z~3," are Simon Dye of Cardiff University in Cardiff, Wales; Ian R. Smail of Durham University in Durham, England; and Johan Richard of Caltech.